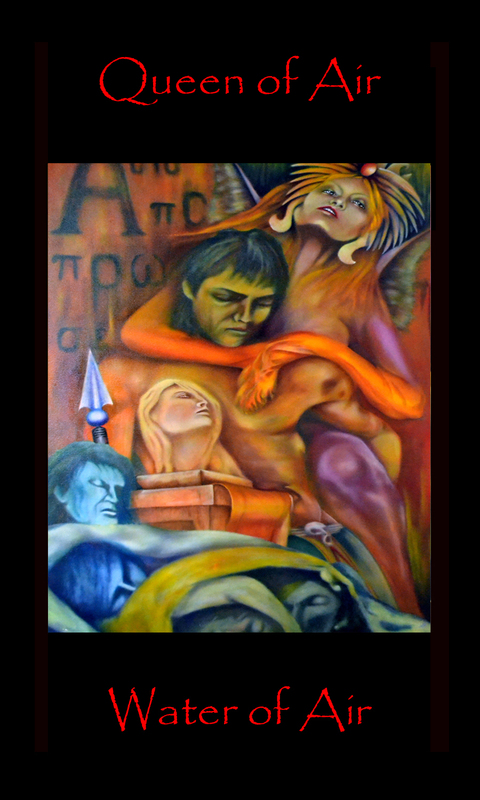 Sphinx, an original oil on canvas painting, 72 inches by 48 inches, 2010. The painting depicts Oedipus in the grip of the enigmatic Sphinx. Tarot Queen Air, Swords, rules from 20 degrees Virgo through 20 degrees Libra. She is the personality type behind Ten of Earth, Two of Air and Three of Air. Three of Air, Three of Pentacles. Rules the second decan of Libra. The air quality of the card is expounded as the enigmatic sphinx. She who is calculating, confident and poised appearing unemotional in her execution of logic to destroy any flawed questioning from a seeker.. She represents.femme fatale.to an extreme as illustrated in the card. The water quality is her personal creative logic and tantalizing appearance that makes an emotional connection to distract any seeker from the resolution of her riddles. These descriptions of character provide a guide for her selection as a significator representing a questioner in a reading. Allocation of digit Minor Arcana cards to the elemental Court personality cards are taken from The Golden Dawn tarot system.